Judy Belmont, M.S., LPC has been a psychotherapist, emotional wellness speaker and workplace wellness consultant for 40 years. Her message of positivity, healthy communication, stress resilience and self-empowerment has reached thousands nationwide through her books, consulting and interactive presentations. Below is the interview we conducted on November 15, 2016. Kim Pratt (KP): Your tagline is “Emotional Wellness for Positive Living” – could start by talking a bit about your philosophy for change and healing? Judy Belmont: There are so many people struggling with mental health issues that don’t go to counseling. I have about forty years of experience as a therapist, and I wanted to focus on life skills that anybody could use, not just the people that go to therapy. I employ the same tools and strategies with my clients, but I wanted to share those with a larger population. Many people don’t have the knowledge or life skills to communicate effectively; for example, they think they’re being assertive when they’re actually behaving aggressively, or they have trouble managing stress and coping with anger. In order to live a positive life you need to have good life skills; that’s the focus of the books I’ve written and the topics of my workshops and lectures. For instance, this weekend I presented at a weekend conference in California where I focused on identifying cognitive distortions. This was for a conference called “Unlikely Collaborators” where professionals from different disciplines came together to encourage effective collaboration. The first step to success for this group was to uncover their own thought blocks and distortions before attempting to interact with their colleagues, so I focused on teaching how to collaborate within yourself before attempting to collaborate with others. This message of emotional wellness goes not just for clients but for anyone who wants to live a positive life. KP: I can relate to that. A big part of HealthyPsych’s mission is to raise awareness around how we can all become psychologically healthier and higher functioning human beings – that mental health isn’t just for people on one end of the continuum; it’s for everybody. The traditional medical model tends to pathologize so we forget to emphasize what it actually means to be healthy. Over the course of your forty years of work, how would you define what it means to be “mentally healthy”? Judy Belmont: I would say the crux of mental health is to be resilient, to be empowered, and to be positive. Being positive does not mean thinking everything’s going to be ok, because sometimes things do go horribly wrong. Instead, being resilient means being able to bounce back no matter how hard you’re hit,seeking support, overcoming obstacles and having some sense of power over even the worst adversity. Being resilient means managing your stress instead of carrying it. We all have stress – it’s not a bad thing. A lot of people think you’re supposed to avoid stress like the plague, but stress can be positive as long as you’re managing it and it’s not controlling you. To be mentally healthy is to be able to bounce back from adversity, to have a positive attitude no matter what comes your way because attitude really is everything. A lot of people feel like a victim in their interactions with others. However, if they feel like they have a sense of control over their lives, then they are more resilient. Without the cognitive distortions holding them back from growing, learning, and being hopeful they can stay positive and lead a proactive life. Physical health is also important. For example, it’s hard to be mentally healthy if you don’t take care of your body, too. KP: I agree that empowerment is a key aspect of mental health and I noticed that in many of your materials published on your site there is a strong theme around empowerment. Can you say a little bit more about how you define this concept? Judy Belmont: Empowerment is realizing external factors don’t make you feel and think a certain way. Here, we’re not talking about significant trauma, like abuse, but more when it comes to just everyday life. In non-abusive situations where you are left feeling a certain way, too often people blame other people for their emotional response; they believe others are making them feel a certain way and therefore they’re not empowered because the control of their life, thoughts, and feelings are with that other individual or group. I help people through my books, workshops, and therapy to realize that the only one making them feel bad is themselves. I talk about the ABC method, which is based on Albert Ellis’ work way back in the 50s; it was the precursor to Cognitive Behavioral Therapy and was called Rational Emotive Behavioral Therapy. A is the act or the event when something happens to you, say someone insults you. B represents your beliefs, or immediate thoughts and reactions to the act, in this case the insult. The C is the consequence; perhaps you react by getting angry and insulting back. Then I ask my clients or the people in a workshop: did that person make you so mad that you insulted back? Almost everybody says yes. That’s not empowered thinking, that’s victim thinking – not victor, but victim mentality. I tell them it’s their belief that made them insult back and become upset. The immediate response thoughts would be, “He has no right to say that; He deserves to be called a name back; He shouldn’t be doing this.” It’s your thoughts that are making you react this way. If a bully acts out aggressively towards you and the response is to bully back then you’re being just as unhealthy – doesn’t matter who started it. If your thoughts, your beliefs, your “B” find a comment offensive and you need to let them know, then instead of insulting back, it’s healthier to be more grounded and tell them, “I don’t like you calling me names and if you continue I’m not going to be talking to you anymore.” Your thoughts will determine how you’re going to behave. A lot of people jump from A to C and feel like a victim instead of a victor. KP: I’ve always appreciated the philosophy of behavioral responsibility which serves as the base of Cognitive Behavioral Therapy; it’s all about perception – how you view a situation, how you talk to yourself about it – that’s where your power is. Judy Belmont: Yes, for instance, in a workshop I usually say, “Raise your hand if traffic stresses you out,” and everybody raises their hand. My response is, “Guess what, your thoughts about the traffic stress you out, the traffic itself doesn’t stress anybody out, that’s just the outside.” Some people in traffic get really upset and curse other drivers while other people take it in stride. It’s not the situation that’s making one person curse and the other person take it in stride, it’s your reaction to it. That’s what empowerment is – owning your feelings and your thoughts and not focusing on blame. There are people who look for the whys when they go to counseling and want to find someone to blame; that line of thinking gets them nowhere and they’re stuck in a moment in time that can’t be changed. Blame never really has done anything for anybody other than make them angry and bitter. Instead of thinking an event in the past should have happened differently, wishing someone was different or wishing the past itself was different, to maintain a healthy perception you ultimately accept that life is unfair and we’re not really owed anything. We’re lucky enough when it is fair sometimes. A lot of people have a sense of entitlement that their lives are supposed to go smoothly – those assumptions can be problematic. KP: I appreciate that point. It makes me think of Fred Luskin’s work. I had a client who spent a lot of time not forgiving her parents; she was afraid that forgiveness meant condoning. However, Fred Luskin makes clear that forgiveness isn’t about condoning a behavior, it’s about accepting that the behavior happened and you didn’t have control over it. The focus should be on healing from it and moving forward based on that setback rather than be defined by it. Too often people are defined by moments in time that were not welcoming situations and they let themselves be defined by it rather than be motivated to make their life and the world better. KP: That’s something I’ve taken from Mindfulness-Based Psychology and other sources, mainly spiritual traditions. It’s a way of looking at these difficulties in life as actual opportunities, not only to heal, but to grow and bring more positivity into the world. I think that’s congruent with what you’re saying about empowerment being a refusal to get stuck. Now, how do you balance this philosophy of empowerment with a healthy, realistic acknowledgement of the ills in society – the seeming unfairness of life in distributing pain and suffering to different groups of people, folks from less privileged backgrounds for instance. .
Judy Belmont: Fred Luskin talked about the Irish bombings and how many Irish people were forgiving almost from the beginning. Those who were able to forgive were resilient and able to move on. Now I don’t know if I’d be capable of that resiliency, it’s more difficult, more challenging, but what other option do you have? Otherwise you’re never going to have power over your feelings; you’re going to let bad things control you. I’m not saying it won’t be challenging – I certainly have it easier than most people, I admit. If you have less support systems in place or don’t have as much validation, you may look for it in religion or other places outside of family origin. I think the power of community and the sense that you’re not alone, having people to reach out to that are supportive and validating, often makes or breaks a person’s ability to be resilient. KP: Excellent point. You talk a lot about that in your work – the power of relationships and connection. There’s a quote of yours that resonates with me; “The healthiest way of grounding is through relationship.” I think that’s spot on and I’d like to hear you talk a bit more about this as well. Judy Belmont: Some people think that to “find themselves” they need to isolate, but the best way to find yourself is through relationships. You don’t have to be a meditator or become spiritual to “find yourself.” Many find it through other people. Now that doesn’t mean you depend on other people for good feelings; instead of making you happy, a person could trigger the opposite. We’re talking about healthy relationships, where you treat one another with respect and you continue to grow as an individual with those people. KP: Absolutely, I agree, that’s the cornerstone to healing, change, and learning – the power of relationships. When I talk to clients about the way they solve problems, especially at the beginning of therapy, it can be scary how they try to make sense of their world – it doesn’t make sense; you just can’t make sense out of nonsense. KP: We humans are social creatures; we need a certain amount of connection (recognizing the variation among personality types, those who are more extroverted vs. introverted). Feelings of separation, of isolation, can create anxiety, since we’re wired to connect. It’s good to have down time, to spend time alone, but if there’s too much of that then it can foster discomfort, confusion and negativity. Do you agree? Judy Belmont: There are different types of being alone. Some people don’t like to be social and that’s ok if they’re not avoiding social situations because of anxiety or in an effort to protect themselves. I know there are certain times I just want to be alone and do work or whatever I want to do. I might not be interested in connecting at that time. Everything in life is a balance. You just want to make sure that your life has a balance between recharging time and social interaction. I have a client right now who protects herself so much that she can’t be open to having much fun. So there’s a balance. KP: Our country just elected the next President of the United States. To say that the political climate stirred up a lot for many is an understatement. How do you bring your “emotional wellness for positivity” mindset into client sessions post-election? How do you help people cope with the sense of loss, or for others a hope, which may be misguided in my opinion, but also the anger that so many have felt on both sides. Could you share your thoughts on that? I was in Seattle after the election and people were protesting in the streets about having Trump as our next president. If that empowers people then fine, but this is how the electoral college went and there’s nothing more we can do except move forward, try to be positive and try not to feel immobilized. To feel a sense of loss and shock, well that’s normal. At first I was incredulous, and now it’s time to move on. It’s not going to stop my life; I’m still going to try and do good in my corner of the world. KP: So you’re saying to make space for the mourning, the anger, for the feelings, but to also emphasize the resiliency of the human spirit, not losing sight of our ability to move forward; basically saying that the story doesn’t end here. Judy Belmont: I really like the Kubler-Ross grieving process model. There’s denial, I was in complete denial, I couldn’t even believe he was running. Then there’s anger; there was plenty of anger when I would hear him give support to things I don’t believe are ethically correct. Then there’s bargaining, which could be the thought that if I talk to enough people then he won’t win. Then there’s depression, and then there’s acceptance. If you go through the healing process, then you realize it’s a loss you can heal from. The stages of grief aren’t just for death. It can be for a dream or over losing a sense of power. Loss can trigger former losses as well, so for some people they come into this situation with a history of previous loss that can be triggered. That makes this current one harder to overcome unless there’s some insight into what’s actually going on. KP: I’m with you on all those points. The night of the election felt as if someone was dying. I appreciate what you said about how loss brings up former loss, whether it’s a more personal or collective experience. For example, how for many women processing this election, it may feel like another case of the overqualified woman losing to the less qualified male. I know it’s more complicated than that, but that’s one narrative it piques. Judy Belmont: It just shows that rationality doesn’t always win out. What won out was the emotionality of some people wanting a change. It didn’t have to do with reason, obviously she was much more qualified. That didn’t seem to matter because emotionally she did not capture enough people who cared about that. They were angry; they want their lives to be different. Well, be careful what you wish for. KP: Absolutely. It’s going to be different alright! Judy Belmont: One positive outcome, for me personally, is that I’m not watching the television or the news in the same way that I was glued to it before the election. It’s given me a break to focus on other things. I’m taking it as a reprieve from politics. It’s refreshing to not be as focused on it right now. That’s my positive. The biggest roadblock to positive change is that people are anchored in the past. There’s a saying: “Use the past as a guidepost, not a hitching post.” I have my own saying too which is, “Forgive yourself for not having the foresight to what is so obvious now in hindsight.” I think that those two things, being anchored in the past and not forgiving yourself about the past, are the obstacles to healing and change. Once you get stuck in what can’t be changed, you’re unable to evolve and heal. It keeps the wound fresh. KP: Those are all wise words. What are the tools you use everyday with clients and clinicians? I know you have a book series titled “Tips and Tools for the Therapeutic Toolbox” – can you tell me a bit about some of the more popular ones? Judy Belmont: I would say my favorite worksheets and activities are centered around communication – assertive, nonassertive, and aggressive communication. Those communication sheets have changed so many lives. I’ve had a lot of feedback on that. 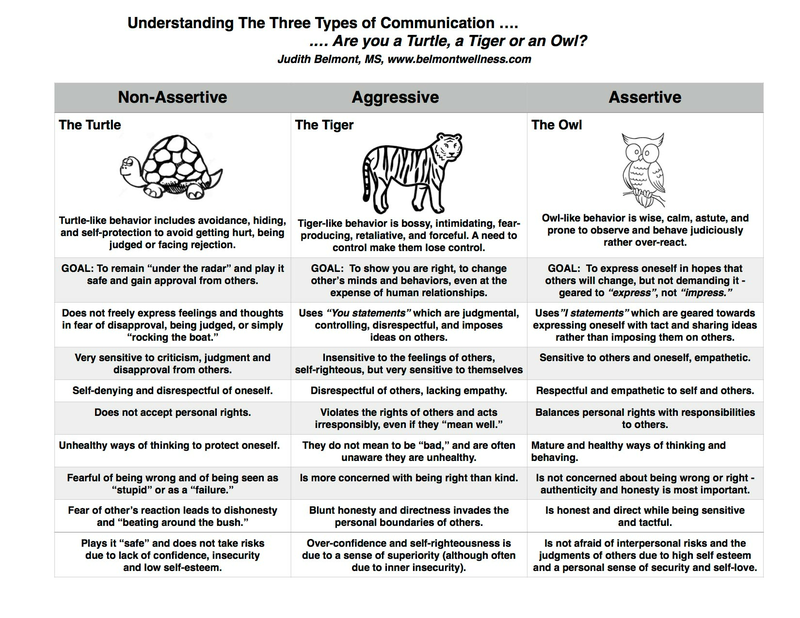 Many people think their communication style is ok when they’re actually being more aggressive. They might think they know the difference, but they can’t actually identify it. Some of the worksheets I have make it easy to distinguish between what is healthy and unhealthy behavior. I’ve found that to be very helpful. Another thing I’ve done in groups and workshops is create metaphorical toolkits. I find that when people have tangible reminders of something they can remember life skills more easily. In my book “The Swiss Cheese Theory of Life,” each of the ten chapters has a metaphorical tool. For instance, I like to use a magnifying glass to help people to remember to identify the cognitive distortions behind a person’s behavior. It’s the idea of being a thought detector. Another example is using an elastic band to show the importance of being flexible. That stretching is good, but not too much, otherwise we get overextended. But, if we’re not stretching ourselves enough, we become limp and lifeless. People enjoy a visual, tangible reminder in a metaphorical toolkit. 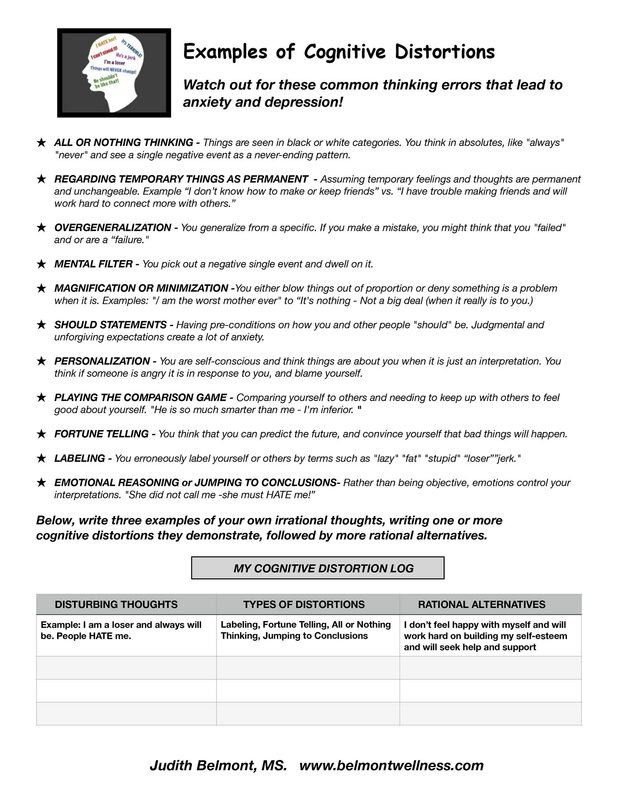 The cognitive distortion sheets, which help distinguish between what is healthy and what is unhealthy, have been very helpful to people. KP: Understanding cognitive distortions is something I often use with clients. Sometimes just having terms to describe these thought patterns we all have can be empowering. I agree that metaphors make these terms more relatable. Judy Belmont: What people find particularly helpful is to figure out their own metaphor – what works for them. I’m constantly using metaphors for issues. Let’s say, when taking on a challenge, using the metaphor of climbing a mountain will help provide a visualization that makes the point clear and impactful. I would say, in general, my greatest contribution is focusing on the importance of developing life skills no matter who you are. No matter how accomplished and bright a person is, if one’s emotional intelligence and interpersonal skills are lacking, one’s personal or professional life success will suffer. KP: The term ‘life skills’ drives home the point that so much of psychological and relational health is about skill development. I think we’re born with a lot of inherent, great qualities and those can get reinforced or occluded, but a lot of it is about learning something new or relearning how to connect with people and empower yourself to be resilient and hopeful. Judy Belmont: What really strikes me is that in school a lot of people don’t get an education in life skills. As adults I see them in my office and they’re blown away by what I see as basic. They didn’t learn these skills in their family. They may not have had healthy role models, or grew up in some social isolation, or in some way were prevented from developing certain skills. Focusing on those skills is important. It’s one thing to go to a therapist and have them listen, for the client to have a safe space to talk, but it’s another thing to teach emotional intelligence skills. The whole field of psycho-education focuses on how, as clinicians, we have a responsibility to be psychological educators as well. KP: Absolutely; information is power. Empathic listening is valuable, but only goes so far. Judy Belmont: Yes, listening is important, but it should be listening with the intent to give feedback and offer information and tools that will help guide a person. About this Contributor: Judy Belmont, M.S., LPC has been a psychotherapist, emotional wellness speaker and workplace wellness consultant for 40 years. Her message of positivity, healthy communication, stress resilience and self-empowerment has reached thousands nationwide through her books, consulting and interactive presentations. She is the author of 6 books and one ebook, including her mental health publisher, PESI’s, best selling Tips and Tools For The Therapeutic Toolbox four book series. This series has provided mental health practitioners valuable resources such as worksheets, handouts and activities to use with clients to teach and reinforce valuable life skills and psychosocial education. Judy is a graduate of The University of Pennsylvania and holds an M.S. in Clinical Psychology from Hahnemann Medical College. For more information, please visit Belmont Wellness, where Judy offers a variety of mental health and wellness presentations as well as personal and professional coaching. Thanks so much for reinforcing my belief that people could benefit from life skills coaching . I see lots of clients who have witnessed or experiences trauma, they lack supports , and coping tools . I wish we could go back to the old days when neighbors were neighbors and looked out for one another. This digital age has created a lack of personal responsibility and accountability. Please stay in touch , you are a friend I would love to have.